We've followed Intel's CPU team's march towards mobile for years now, but we've seen very little from the wireless group. That's all beginning to change. Earlier this year at MWC, Brian and I had one of our first meetings with the wireless group at Intel. In that meeting we met Aicha Evans, Vice President of Intel's Mobile & Communications Group. Every now and then I get to meet someone who is a pretty awesome combination of smart and passionate, and Aicha definitely fit the bill. Unlike most of the folks I talk to on a regular basis at Intel, Aicha didn't come from the CPU side of the business. She got her start at Skyworks, an RF/comms company, before eventually being recruited by Intel to help develop their wireless strategy beginning with WiMAX. While most folks tend to have a very center-of-the-universe approach to talking about the part of mobile SoCs they contribute to, Aicha struck me as unique in that she ultimately views her role at Intel as one of enablement. In her own words: everything that computes, connects. She's taken it upon herself to make sure that Intel's computing story isn't held back by the lack of a connecting one. Her role is a challenging one. Anyone looking to do big things at Intel in the computing side of the business has decades of success in CPUs to rest on. Trying to do the same with wireless at Intel comes with no such safety net, and definitely no head start. That initial meeting, which unfortunately remains off the record (it was a pretty awesome one), got me wondering if it would be possible to get Aicha talking directly to the AnandTech audience. 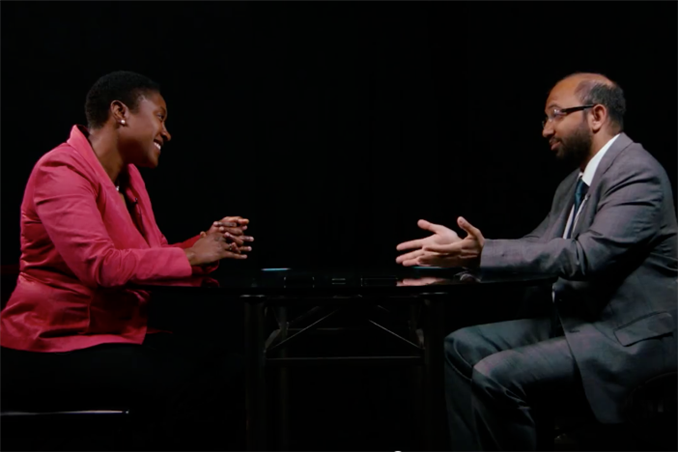 A couple of months ago, while visiting Intel, Aicha agreed to sit down with me at Intel Studios and talk a bit about their wireless strategy on camera. She also agreed to personally answer any questions AT readers might have about Intel wireless or the industry in general. In order to make the interview a bit easier to digest, Intel split it up into 5 - 7 minute segments. I've embedded them all below, along with a brief synopsis of each video. After watching the segments, be sure to leave any questions you have for Aicha in the comments to this article. Once we get enough, Aicha will look through them and answer them in an upcoming post. Aicha's story is actually a great one and I'm sad that we didn't get the entire thing on film, but in this first video you get a bit of her story as well as insight into exactly when Intel got the wake up call that it needed to focus on wireless as well as computing in mobile. Intel's march towards mobility hasn't been a swift one. The first video talked about when Intel brought Aicha on, now this video takes us through the time when the company started taking wireless seriously. With the background established, here I got Aicha talking about the integration of Infineon Wireless and how things are going with the LTE roadmap. We dive a bit deeper into the LTE discussion, bringing up the challenges that Intel will face and where Aicha believes the company's strengths are. Here we talk about room for improvement in wireless technologies, and what sort of innovation we can expect in the coming years. The coolest part of the final segment is where Aicha shares a bit about what drives her. Here we also end with a call for reader questions, which Aicha will be answering herself in the coming weeks! As I mentioned at the start of the post, Aicha will be reading your comments. If you have anything you'd like to hear her answer about mobile or wireless, leave your questions in the comments below! Really wonderful interview. I'm really hoping that Intel is working hard towards building global LTE (heck, even multi-band LTE to cover all US carriers) so users don't have to think about whether their phone works on XYZ network. Of course there is "secret sauce". The spec gives you a range of different ways to communicate info, it doesn't tell you how to do everything. - Should it use CTS/RTS or not? - How should it balance aggregation vs latency? Yeah, despite Brian's recent comments I ended up getting a Netgear PTV3000... At $50 with a $10 discount it seemed more sensible than paying $35+ for the SlimPort USB/HDMI adapter for my Nexus 7 (never mind that currently you can't even find those anywhere, tho there's some $25 knockoffs on Ebay). Haven't had the time to try it yet, tho it did seem like they've been putting out firmware updates left and right (going by the Amazon reviews). The PC/WiDi setup seems far more complicated (I guess Miracast is more of a it either works or doesn't deal). I know reviewing flawed stuff is like low hanging fruit sometimes but it seems that exposing the issues with at 'least one of those WiDi/Miracast boxes might be worthwhile.